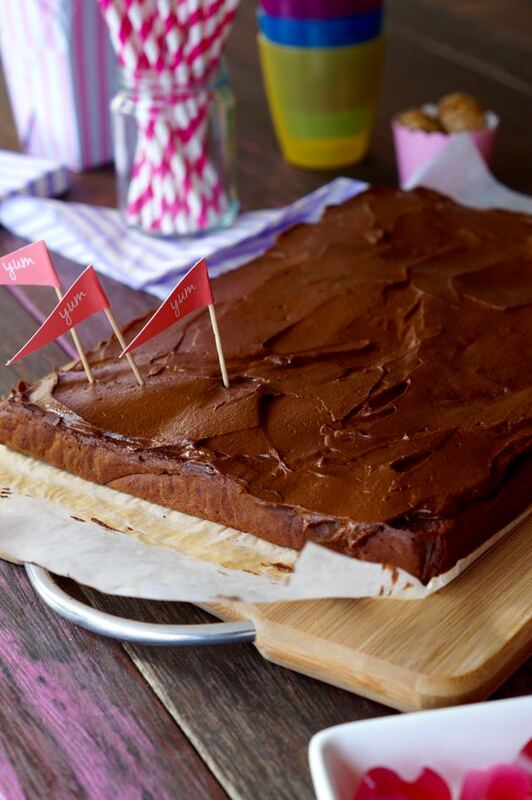 Gluten Free Nut Free Brownie (perfect for kids!). We have a stack of Merrymaker healthy brownie recipes here. We’ve got the original recipe, the sweetener free pumpkin variety and the raspberry sweetener free (our personal favourite). But it’s about time we shared this Gluten Free Nut Free Brownie recipe. We’ve had lots of requests to share more nut free recipes because nuts are banned at school and are a no-go at Kids’ Parties! So ta-da, we welcome the Gluten Free Nut Free Brownie. It’s perfect for your kids party. This particular cake was actually made for our friend’s son’s birthday! All the kids loved it. They even told us! But… we definitely didn’t mention any of the ingredients! 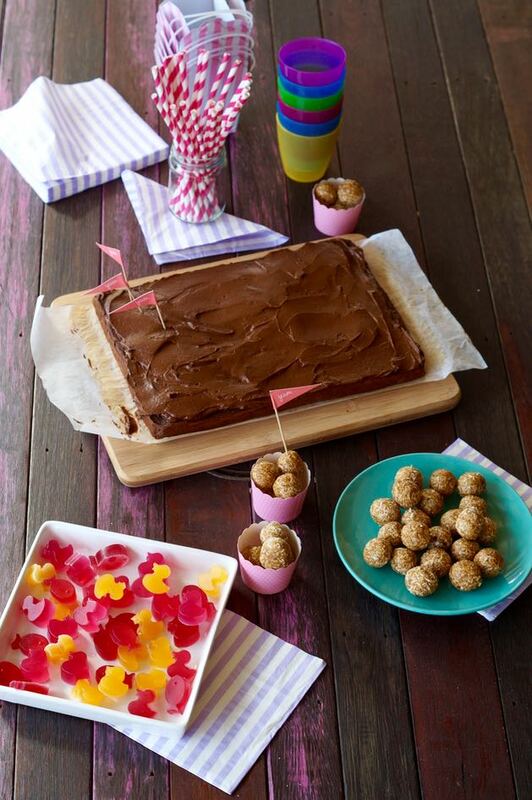 We served it with kid friendly sugar free lollies. You can get that recipe here. This healthy nut free brownie is also perfect for school snacks. Freeze them in small portions, perfect for Little Lunch or after school snacks. 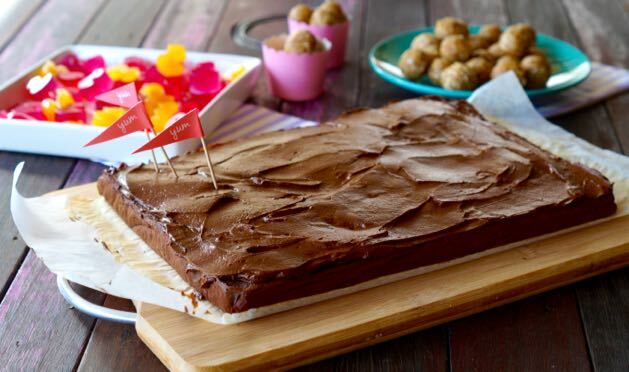 All the kids will want to come over for this delicious brownie! Let us know what you think. Or more importantly let us know what your kids think! Start with the cake. In a food processor puree the sweet potato. Add the eggs and whiz until smooth (this will take around 2 minutes on high speed). Add the coconut sugar, coconut oil and vanilla, whiz again until smooth. Add the raw cacao powder, coconut flour and cinnamon in to the mixture. Transfer the batter in to the lined slice tin and smooth the top evenly. Once cooked, allow to cool, then turn on to a wire rack. Drain the dates and whiz in a food processor until a smooth paste forms. Add the coconut milk, honey and vanilla, whiz again until combined. Now to make it chocolatey! Sift in the raw cacao powder and mix until glossy and smooth. Spread the frosting evenly over the cooled cake. Cut the cake in to squares and serve. This is a big cake great for Kids Birthday Parties! Halve the mix if you don't need so much or freeze half!